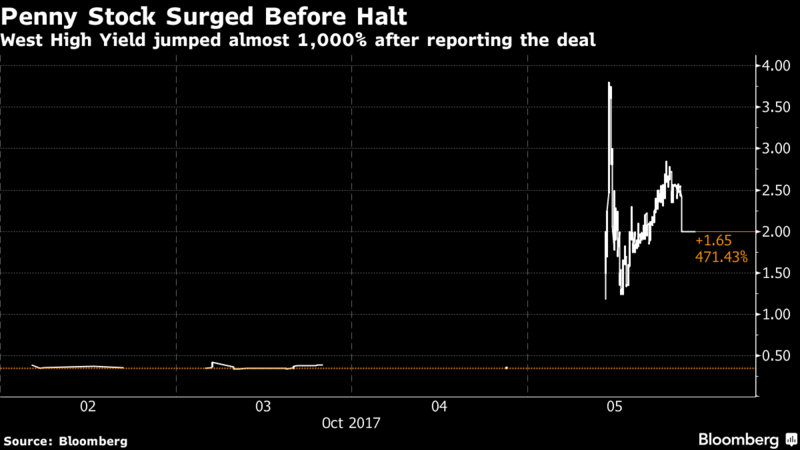 (Bloomberg) — Investors are fuming over the collapse of a $750 million mining deal that sent a tiny magnesium explorer soaring, sparking criticism that Canada’s light-handed approach to regulating its venture market needs to get heavier. Canada’s investment regulator won’t be reversing the trades on West High Yield (W.H.Y.) Resources Ltd. from Oct. 5, when the Calgary-based penny stock surged almost 1,000 percent on a deal to sell its main assets to an unknown buyer. The announcement “did not contain information which was either misstated or inaccurate,” according to a letter obtained by Bloomberg News that the Investment Industry Regulatory Organization of Canada sent to an investor in the company. Perhaps not, but the deal certainly raised some red flags. West High Yield filed a purchase and sale agreement that showed Gryphon Enterprises LLC as the buyer prepared to pay $750 million for West High Yield’s main magnesium assets in British Columbia when the whole company was worth only $16 million. That price tag would have made the deal the fourth-biggest mining-asset sale this year globally — underpinned by a company with no website, whose chief executive officer uses an AOL email address, and is based at a residential house built in 1992 in Swanton, Maryland. “The regulators are letting people like me down,” Manoj Khandavelli, an investor in Newfoundland who put C$50,000 ($39,000) into West High Yield, or 60 percent of his personal portfolio. He says he read the sale and purchase agreement 10 times and believed West High Yield had at least a financing commitment. Khandavelli bought the stock on Oct. 5 at about C$2.40. After an almost three-hour halt the stock — which trades under the ticker WHY — jumped to as high as C$3.80, from just 36 cents the previous day. It closed at C$2, giving the company with no revenue a market value of C$114 million. Trading has been halted ever since. The Alberta Securities Commission declined to comment on whether it’s still reviewing the company and the deal. Khandavelli has already lost 17 percent on paper, and stands to lose more if the stock plunges once it resumes trading following the announcement of the failed deal. Paul Howard, a spokesman for IIROC, as the trading regulator is known, declined further comment beyond confirming the trading letter sent to investors. Unproven penny-stock companies, in Canada or elsewhere, are never for the faint of heart. 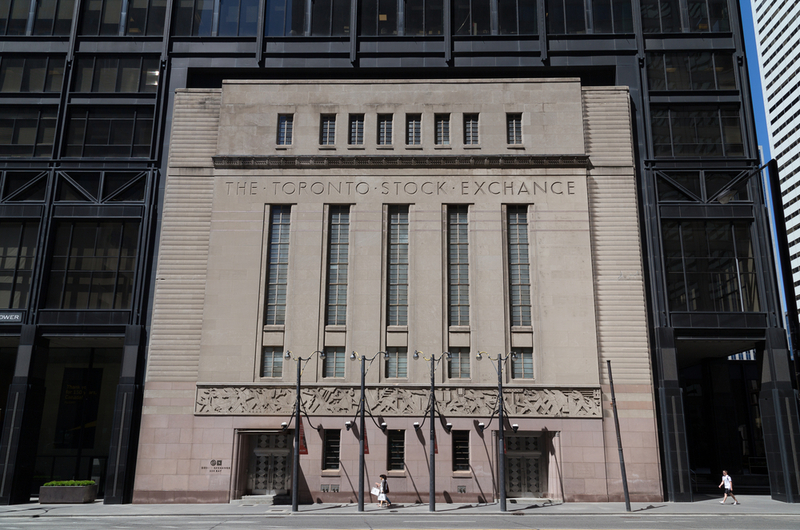 Canada’s TSX Venture Exchange has proven an attractive home for junior miners because its listing standards give them some breathing room to raise money while chasing claims — they don’t require any net tangible assets, earnings or revenue, but rather look for “significant interest in a qualifying property,” along with investment pledges. In turn, it’s typically drawn investors chasing high-risk but high-payoff gambles. West High Yield’s Oct. 5 announcement prompted 2,254 trades valued at almost C$5 million, according to data compiled by Bloomberg. The average size of the trade that day was about 1,000 shares, indicating small buyers were active. “That’s what investors that participate in this market are looking for, is that potential outsized return, but it comes with outsized risks too,” Brady Fletcher, head of the TSX Venture Exchange, said in an Oct. 10 interview. The exchange has the ability to freeze a stock, force additional disclosure or unwind trades if it believes there’s been fraudulent activity but, “we don’t try to sit here and determine what’s a viable business plan on our own,” he said. West High Yield had continued to trade on Oct. 5 as more red flags appeared. Its filing stated Gryphon’s legal representative was Baker McKenzie, yet the law firm said later it had no knowledge of the deal. Google searches showed that Gryphon operates from a modest two-story, beige clapboard apartment in Janesville, Wisconsin and that CEO Stephen Cummins had a previous run in with the Colorado Securities Commissioner for operating without a license. After the morning halt, the stock traded for another four hours before it was halted again the next morning. The Alberta regulator said it was reviewing the deal given the magnitude of the transaction. Promoting liquidity and an active market are one thing, but a deal of this size should have had the regulators scrutinizing more closely and acting faster to halt trading, says Tony Simon, a former junior mining deal-maker and co-founder of Canada’s Venture Capital Markets Association. Meanwhile Gryphon’s lawyer, Thomas J. Kenan, said by phone that Cummins, the CEO, still expects to get the money very soon. When told that West High Yield had terminated the deal, he was unfazed. (Story by Danielle Bochove, Kristine Owram, and Natalie Obiko Pearson with assistance by Doug Alexander, Aoyon Ashraf, and Maciej Onoszko).